Both windows of our Paris rental looked out on the construction site across the street. Though the project had been going on for many months, recent Airbnb reviews didn't mention it. Like many people scouting for Airbnb rentals, I always read online reviews before booking. At a minimum, I look for comments saying that a place is clean, quiet and has a comfortable bed. It’s even better if they rave that the pictures don’t do it justice. But, as a frequent Airbnb user, I’ve also detected a seamy side of the company’s online review system. In effect, it discourages travelers (called “guests” in Airbnb parlance) from pointing out the drawbacks. And those who seek Airbnb’s help with a problem during their stay risk being negatively reviewed by homeowners (called “hosts”). This can lead to reviews that are so uninformative that they are little help to prospective guests, as my latest experience illustrates. For those planning vacations that involve Airbnb, it’s a cautionary tale. Only once we got there did we discover that both windows looked out across the narrow street onto a building that was surrounded by scaffolding and draped in tarp. Not a single recent guest had mentioned it. I reminded our host, who was there to welcome us, that we had asked about construction when we made the reservation. “But that was in February” – eight months earlier, she replied. Repair and maintenance of the façade (ravalement de façade) had been going on for many months, according to the concierge, or caretaker, of our building. Though it didn’t make our place uninhabitable, occasional noise permeated the double-glazed windows. We assumed the workmen could see us as easily as we could see them. Whether you call it deception, bad luck, or a combination of the two, this was our second such experience with an Airbnb rental in Paris. (That’s why I had asked about construction before booking.) On the previous occasion, concrete dust permeated the premises, making it unhealthy to stay there. In that case, Airbnb had been enormously responsive: They issued us a full refund; paid for us to spend a night in a hotel while we looked for alternative lodging; reimbursed us for Uber rides; and gave us a $100 coupon toward future travel. Not eager to disrupt another stay – especially since the latest situation wasn’t an emergency – we called Airbnb customer service to see what else could be done. Based on a photo that we submitted, a caseworker told us that we would be eligible for a discount of up to 20 percent, since the construction diminished the value of the apartment. She offered to call the host immediately to arrange it, but we thought it best to wait until our reservation had ended. During our remaining 15 days there we had another issue – the refrigerator didn’t close properly. At first the host professed no knowledge of the problem but, when we persisted, blamed it indirectly on a previous guest. It seemed she had taken a chance that we’d eat out and not notice. But while traveling in France we prepare most of our own meals. Our food was spoiling. We needed something done. After I politely explained this, she sent a workman – twice, since the first repair attempt was unsuccessful. Both times we consented for this stranger to enter the apartment in our absence, unaccompanied. Though we weren’t entirely comfortable with that arrangement, we made an effort to cooperate. By way of background, at the end of each stay, Airbnb prompts guests and hosts to evaluate each other. For the next 14 days, they cannot see what’s been said. When that comment period ends, neither party can any longer post reviews, and what they have written becomes public. During the past five years, my husband and I have stayed at 26 properties in the U.S. and Europe. Most of our stays have been satisfactory. A handful of them have been wonderful. One led to a lasting friendship with our host. We’ve been reviewed by 18 of our hosts, and this was the only one who wrote anything even remotely negative about us. Perhaps it was a preemptive strike – disparaging us because, based on all that happened, our Paris host expected us to write a negative review of her. Or maybe it was just out of spite. Either way, what she said was potentially damaging: Other hosts who read it, when deciding whether or not to approve a booking, might think our complaints were petty. One might say that we’ve had a pretty good track record and should consider ourselves fortunate. But for me the incident underscored the chilling effect the system has on guests, and the enormous power it affords hosts. Positive reviews are so important to hosts that they don’t hesitate to pressure guests to write them. In October, after we checked out of a home in Beynac, France, the host messaged us on two separate occasions, saying, “Your opinion on Airbnb would make us very happy.” Another recent host, in Boulder, Colorado, started hammering us to write a review before we even arrived at his house. He was correct about my not posting reviews – another thing hosts can check when vetting potential guests. The reason is that I am a journalist covering, among other things, travel and the sharing economy. If a host asks, after the 14-day period is over, why I haven’t posted a review, I explain this. With the Boulder host, I covered this in advance since I didn’t want there to be any implication that I was willing to make a deal. For the record, I don’t go on press trips, take freebies or expect any other form of special treatment, either. All I could promise was to water his plants and take great care of his house, which, including local taxes and Airbnb fees, was costing us $341 per night. On this platform, as on others, though, reviewers are a self-selecting group. For example, a friend of mine stays mum about her experiences as an Airbnb guest because she values her privacy. For those who speak up, there are incentives to keep it positive. Saying something negative could make guests look cranky; foreclose a repeat stay at a place they, for the most part, liked; or prevent them from being accepted by future hosts. With our most recent apartment, for example, almost everyone praised the location and the neighborhood, but no one said they were disturbed at night by elevator noise so loud it could wake the dead in the nearby Montparnasse cemetery. Some people might feel guilty saying such a thing after a host has made certain thoughtful gestures. Judging by the comments about various places we’ve rented, a cheap bottle of wine seems to go a long way in this regard. One person, reviewing our most recent Paris rental, called attention to the L’Occitane shampoo the owner provided. Really, who cares? Even before our latest experience, I had begun to wonder whether there is such a thing as too many positive reviews. Especially in popular destinations, hosts who have stacked up dozens of them tend to charge higher rates. Some stop addressing wear and tear, or even replacing grungy linens, because they are able to rent the place regardless. And then there is the matter of attitude: hosts who act like they are lending us their home, rather than charging us to stay there. Our latest one had a bulletin board in the kitchen displaying “Merci” cards from grateful customers. Needless to say, we didn’t leave one. Instead, when we got home to New York, I immediately resumed contact with the Airbnb caseworker who had answered my phone call from Paris. While my claim was pending, my host posted her review. During our initial conversation, the caseworker had assured me that, under the circumstances, any negative review would be taken down. But my subsequent note, asking her to do that, was intercepted – by her boss. And with that, she was gone from my case. What happened next shows how the disposition of an Airbnb claim depends on the whims of the person handling it. 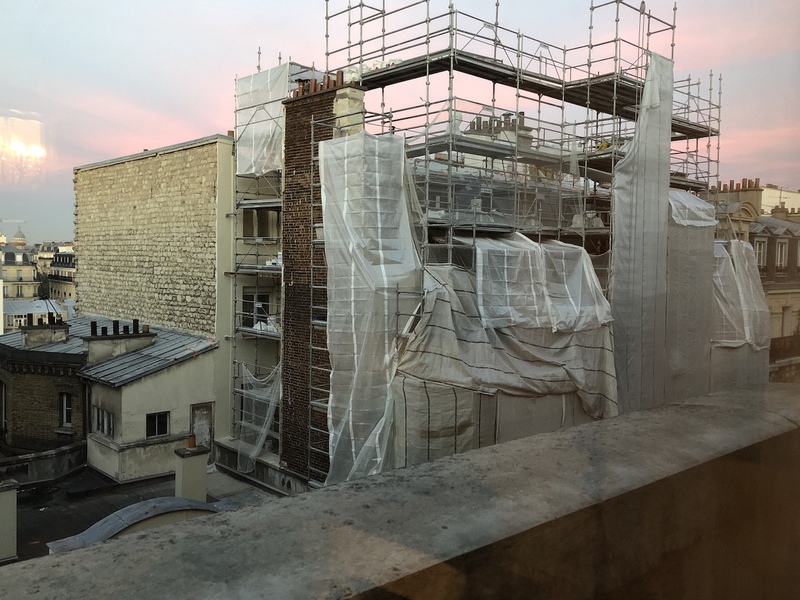 Though the previous caseworker found the photo I submitted from Paris was sufficient evidence of construction, responding to my claim the host argued that this was “façade maintenance” and that therefore I wasn’t entitled to a construction discount. That prompted the new caseworker to say we needed a video of exactly what was happening on the scaffold. Who knew? And besides, by then I was back in New York. After considerable wrangling I got the 20 percent discount, with the host and Airbnb each kicking in about half. My refund was $415. But as for the host’s review, Airbnb refused to take it down. “It is our general policy not to remove reviews,” the caseworker wrote, no doubt quoting from a company playbook. Only in rare instances, outlined in its content policy, will Airbnb consider deleting a review. The list includes “content that provides specific details or outcomes of an Airbnb investigation,” but that hadn’t happened in my case. What about the fact that the prior caseworker had assured me that a negative review would be removed? She might have misstated company policy, said her boss, whose decision was final. The best I could do was to write a reply, describing what happened. That rebuttal would give me the last word and become part of my profile for potential future hosts to see. I can only hope that they will take my host’s comments with a generous dash of French sea salt. With that, I reached the end of the line as a consumer, but not as a journalist. Putting on my reporter’s hat, I contacted the Airbnb public affairs office. By then I was writing a story inspired by personal experience. What happened to me could certainly happen to others. I wasn’t asking for any special treatment, but as a reporter I could pose the questions that I imagined other consumers would want answered. The trouble is that the system offers no incentive to post open and honest reviews. And since Airbnb doesn’t vet most listings, there’s no quality control either. It’s a platform built on trust that gives habitual liars free rein. In this setting, our recent host could deceive us with impunity and keep on snaring others the same way. She has retained her “superhost” status, a designation given to hosts who have received a certain number of positive reviews. The headline for her listing continues to trumpet the “great view.” She doesn’t offer a single photo to support that claim – even one snapped before construction came into the picture. If reviewers could comment freely, without worrying about the consequences, at least one of them would have called out this shameless hype. Deborah L. Jacobs is the author most recently of the five-time award winning book, Four Seasons in a Day: Travel, Transitions and Letting Go of the Place We Call Home, about her adventures – and misadventures – living in France. Follow her on Twitter at @djworking and join her on Facebook here. Wow, your article is really an eye opener, and so true. I am currently staying in an airbnb in France (my first time, though I plan to use many times). While I am generally happy with my lodgings this time, it has occurred to me that I would not ever want to post anything negative because of the types of repercussions you mention. Clearly airbnb’s system is not working the way it should. Any suggestions about how I could underscore the downsides of the review process to airbnb? P.S. I purchased and read your book, which I really enjoyed. Thanks for your kind words about my book, Four Seasons in a Day: Travel, Transitions and Letting Go of the Place We Call Home. Glad to hear you are having a positive experience with your current rental. You can submit suggestions via the Airbnb website, but I don’t know how actively they are monitored. Very informative article – especially for those who use Airbnb frequently. As a note, I have used Vacasa twice and have been very pleased with their properties and their attention to detail. I’ve been wanting to try Vacasa, and have written about this Airbnb alternative, but so far haven’t traveled to a place where they had properties. Great to have your feedback about them. Please never be afraid of leaving an honest review. The policy of “rating the guest” was brought about my hosts feeling they didn’t have any control over negative reviews. I think YELP has a good policy of enabling the vendor to ‘respond’ to a review that is unfair, but I still think the entire systems of leaving reviews is a double-edged sword. In your case, get your husband or companion to write the review – you can remain anonymous. I think the reason you provided for not wanting to leave honest reviews is insufficient. Obviously whenever we choose to stay with Airbnb hosts we are intentionally to say with non-professionals. Hotels might be a better choice. Having said all that, I agree — I do not like the tyranny of reviews. In addition to Airbnb there are SO MANY lodging assistances agencies. Airbnb seems to be easy to use and omnipresent and RELATIVELY cheap. As a supplier of gites and chambre d’hotes (France) I find it in my best interest to spread the property selection options around. Our property is relatively new, so we haven’t yet signed up with the dozens that exist, but we have created a spread sheet to which we add continually to describe and rank them. I’d be willing to share that with you if you are interested in having a conversation. Best of luck and thanks for publishing! Thanks for your thoughtful comments. The decision to leave a review (or not) is a personal choice that we should all be free to make without explanation. For all the reasons covered in this article, it is unrealistic to rely on reviews as a method of quality control. At least your issue was photograph-able. The mildew we breathed in for a week in Cambridge, MA could not be captured through an image. Why did we stay? It was move-in week for colleges, and parents had descended on the Boston area from all over the world, leaving no vacancies within walking distance of our son’s apartment. Our communications by text with our “host,” who we never actually met, were amicable, as was their review of us. In the end, they were disgruntled because they purchased an expensive humidifier to try to appease us, but when it filled up in just one day and was never emptied, the odor lingered. They actually admitted that they had previously painted as a result of some mold they discovered in this damp basement apartment. We tried to negotiate a reduction, but they wouldn’t budge. We partially disputed our charge with Amex, and after a lengthy investigation, were denied. Needless to say, our review of them was not favorable, but as you point out, Airbnb tends to side with their hosts. Our review was removed! We are appealing the decision with Amex and are awaiting a new outcome. We have not used Airbnb since. One has to wonder when the public health department will begin spot checking safety conditions in these short-term rentals. I am glad you have written this article; I hope the company will stumble upon it and re-consider their position. Thanks for sharing this experience. Would you like to post the text of your review here? I think other readers would be interested to see the type of content that Airbnb is taking down. Thanks for such a helpful and insightful piece. It was certainly an eye-opener! Thanks for your kind words. Happy travels! My husband and I have stayed in about 10 shorterm Airbnbs over the past years–a mixed bag. We were doing it for either a) the kitchen or b) the use of a washing machine in the middle of vacation. Not to mention their affordability compared to hotels. After our last trip, where we stayed in a mix of accommodations (from a castle to a guesthouse to 2 Airbnbs) in Ireland, though, I think we’ve finally had it with Airbnb. When you’re in a foreign country at night and have trouble seeing/opening the two locked gates before you reach the lockbox near the apartment’s front door (and then can’t figure out how to open THAT door–we tried every which way for more than an hour, including kicking it) and can’t get ahold of the owner (turns out he was away at a wedding and only checked his phone once), it sort of kills the joy. Plus none of the 30 previous reviewers had bothered to mention that the Galway apartment we’d rented was directly above the most popular bar in Galway! We knew the apartment was in a “good” location, but that was a little too good. After we returned and I mulled over what exactly to write for my two Airbnb reviews (I hate to be negative but there were more issues than just a recalcitrant door and pub singing–who knew you had to turn the hot water on… and how do you do that?) I managed to miss the 14-day deadline, so left them reviewless for the next unwitting customer. I wish I could have warned them (I did leave notes for the owners to give out better instructions). A final note about the reviews of US–our favorite was the one from a Russian owner of a nice house in Fort Lauderdale (nicest place we’ve stayed–the daily rate had doubled the next time we looked at it). She wrote: “Laura & Warren were the sweatiest couple we’ve had so far.” It took us a second to realized she thought she was writing “sweetest.” No way for her to change it, though, once posted to Airbnb! Thanks for this excellent cautionary article, Deborah. Thanks so much for sharing your experiences, Laura. I’ve been traveling in Southeast Asia for the past month and have stayed at some lovely hotels for less than the cost of the dumpy Paris apartment that I wrote about here. Almost always a sumptuous breakfast was included, too. After my latest episode with Airbnb, it has been a relief!